Many marketers spread their efforts across multiple channels. It’s an effective way to reach a wide audience and generate more traffic – and more leads. It can get overwhelming to manage numerous channels at once. Trying to optimize all your channels is complicated. What works well for one channel might be ineffective for another. Here’s a collection of tips you can use to generate more leads from all your channels. We’ll cover ways you can generate more leads from each of the most common B2B marketing channels, as well as additional resources you can use to dive deeper. Before we get into each individual channel, let’s talk about tips you can put into action across all of them. The first is A/B testing, an effective method for driving continuous lead growth across the board. Let’s use email as an example. Take one of your existing emails – this is your test A. Next, you identify one particular aspect of that email that could use improvement. For example, if your open rate is low, use your subject line as your variable. Create a copy of your test A email, and change the subject line to something you think might perform better. Add a first name or company name personalization token, for example. So if your original subject line is “Improve your website CRO”, you could try “Improve Acme Inc.’s Website CRO”, inserting a company name token to try to drive your open rate. That changed version is your test B. You run both emails repeatedly until you’ve gathered a good amount of data, and compare their performance – in this case, open rate. Then you keep the one that performed better, and discard the one that didn’t. The real trick is that you keep repeating this process. By continually testing your best-performing marketing efforts against new ideas, you’ll never stop improving. The second way you can boost your leads across all your B2B marketing channels is to use website visitor tracking software. All of your B2B marketing channels drive traffic to your website, whether it’s in the form of blog posts, landing pages, or your actual website. The ultimate goal here is to convert those visitors into leads. The sad reality is that only 2% of your traffic converts. You can boost that up a bit higher with effective conversion rate optimization (CRO) techniques, but even then, there’s a huge volume of potential leads that are leaving without converting. Website visitor tracking software like Clickback WEB gives you the chance to reach out to visitors that didn’t convert. In the B2B world, if a company visits your website, they’re probably considering buying from you. Clickback WEB checks whether a visitor’s IP address belongs to a company, and if it does, it gives you a list of potential leads at the company, along with actionable contact information you can use to reach out to them. All your channels drive traffic to your site, and if you can capture leads that got there but didn’t convert, the effectiveness of every single channel suddenly jumps. Email is a marketing staple for a reason. It’s the most effective marketing channel for B2B. With effective marketing automation, you can easily develop and send nurturing email drips that convert. The problem is that many marketers jump the gun. They get a new lead and rapidly start sending them messages pushing them to make a purchase. Inbound marketing in general, and email in particular, is a waiting game. People are generally reluctant to hand out their contact information, so when they do, immediately firing a salesy email into their inbox is a quick way to make them regret it. This is when they hunt for the unsubscribe button. Patience is the key. Instead of rushing them along their journey, ease them each step of the way. Start off by sending them some valuable content related to why they gave you their email in the first place. If they subscribed to your blog, send them your latest blog posts. Listen to your contacts – never make your inbound nurturing emails about your company or your services. Focus on them and their problems, and guide them to the realization that you can help them with those problems. You need to build up trust with your inbound leads before you try to convince them to buy your product. It takes patience and time, but when they get there, they’re much more likely to make a purchase. There’s a phrase that’s popular in the marketing world: “content is king”. 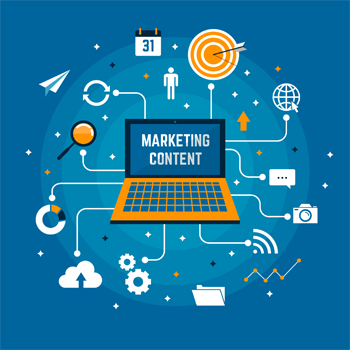 Content marketing forms the foundation for the inbound philosophy – if you consistently create valuable, high-quality content that people love to engage with, you’ll generate warm leads that are more likely to purchase. It works, but the question many marketers face is what kind of content is valuable enough to be effective. Blog posts are a pretty clear choice – every company has a blog these days, so it works, but it’s also very difficult to stand out. What sort of content really works? The answer: the content your target audience needs. The idea here is the same as with email – don’t make it about your company. Identify a problem your target audience has, and create a fantastic piece of content that totally solves that problem for them. It doesn’t matter what form that content takes – it might be a blog post, a white paper, a video, or anything else. What’s important is that it solves a problem for the reader. Video in particular is gaining traction as a powerful form of content marketing. For a well-made video, the engagement factor is high; people will pay more attention to a video of an expert explaining how to solve their problem than they will to a long article explaining the same. Instead of writing yet another blog post, try setting up a camera and talking about your topic instead. Moz are absolute pros at this with their Whiteboard Friday videos. A relatively recent development, the use of social media as a B2B marketing channel has become unavoidable, and it’s only growing in importance. Since 2007, when Facebook unveiled their paid advertising platform, marketers have been driving lead growth on social media with great success. It’s important to remember that social media advertising is outbound, not inbound. You’re not trying to slowly guide someone towards an action – your ad needs to convince them to click without any other context. The images you use need to draw the eye, because they’re generally what will make people stop scrolling and pay attention to the ad. Your content needs to be punchy and powerful, communicating the unique value proposition (UVP) of your offer and convincing the reader to click the ad in just a couple sentences. Beyond writing compelling ads (don’t forget to A/B test your ad content and landing pages! ), one way you can improve your lead growth is ensuring your ads are reaching the right audience at the right time. Analyze what trends exist among people who are converting on your offers, both in this channel and elsewhere. How old are they? What industry are they in? Are they male or female? You can use this information to narrow down your targeting so your ads are displayed to people who are more likely to click and convert. Do something similar for time of day. Analyze what times of day have the best click and conversion rates, and focus your ads on displaying at those times. You can even take it one more step and see what the ratio is of desktop and mobile devices and focus on those trends, too. The ideal scenario is that people search for a solution to their problem, and your website is at the top of the list. They look at it, see that you offer the perfect way to solve the problem, and become a customer. Of course, in reality, it happens more slowly than that, but the fact is that nobody will convert on your website if nobody can find your website. You want to rank high in the SERPs, and to achieve that, you need top-notch search engine optimization (SEO). SEO is a complex topic and it’s constantly evolving as Google updates their algorithms. Moz, one of the foremost SEO experts, provides a free SEO Learning Center that you can use to get a strong start. If inbound marketing is a waiting game, outbound is the opposite. It can generate large volumes of leads very rapidly, with much less time and effort spent. If your outbound email marketing isn’t as successful as you’d like, or you’re considering whether to try it, read How to Send Mass Email Successfully: A Step-by-Step Guide.